Weather delays and previous commitments with stakeholders in Germany caused data acquisition with the ZTEM™ system in Finland to be postponed. 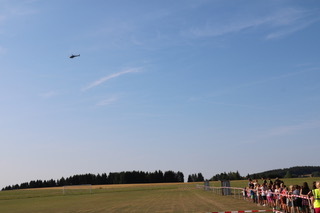 Therefore, our pilot/helicopter as well as Geotech’s crew travelled to Germany as the campaign moved into the Geyer area. Supracon’s crew and equipment arrived on August the 16th and tests and production started the same day. 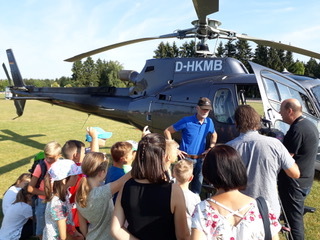 On August 17th a public event took place at the field that hosts the TSV Geyer soccer club with around 90 children from local schools (ages 5 to 16) and 100 adults in attendance who had the opportunity to watch the helicopter either land or take-off with the sensor, and ask questions to our pilot and Supracon’s crew. 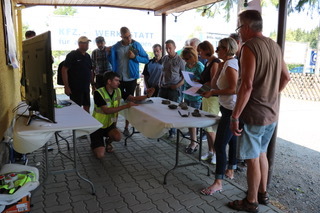 Several stations were available for attendees to visit, versing about the importance of raw materials, the geology of the Ore Mountains, magnetic properties of minerals and rocks, and the INFACT project. 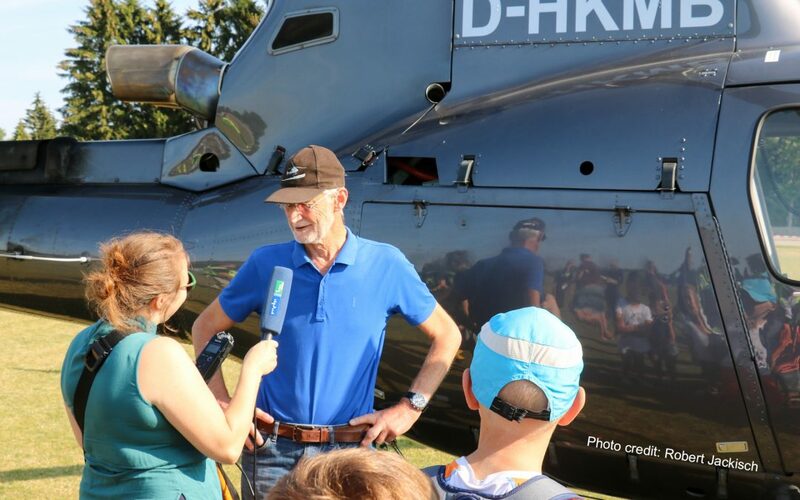 Volunteers from the Helmholtz Institute Freiberg for Resource Technology, Dialogik, Supracon – both INFACT partners -, and the Municipality made sure safety was a priority for all parties involved and guided visitors through the different stops planned for them. The event was highly covered by the press and regional media and the feedback provided by attendees was very positive. After the stakeholder event, acquisition resumed with Supracon completing 510 km of line data in Geyer. Geotech’s crew arrived on site before the VTEM ET system. After its arrival, the system was assembled and the survey was able to start. Special considerations were taken by both partners to minimise disturbances in such a highly populated area. During the Airborne Time-domain Electromagnetic acquisition, a source of noise present in the data was identified as external, ruling out any problem with the equipment. Data acquisition was able to resume and the frequencies associated with noise would be removed during processing. 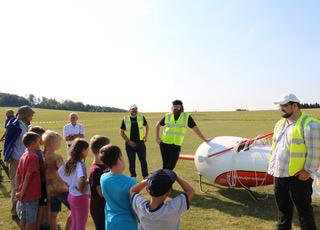 The campaign finished in Geyer with a total of 225 km flown with the VTEM ET system. In spite of the presence of cultural noise and television towers, which constituted a challenge for data acquisition, the geophysical surveying in Geyer was completed successfully. The next phase of the INFACT 2018 acquisition campaign is delayed as we are awaiting flying permissions to be granted from the Spanish Civil Aviation Agency to start the airborne geophysical survey in Spain.